k a t: too tall? one of the best things working at harbourfront centre is working and attending lectures at the same time. 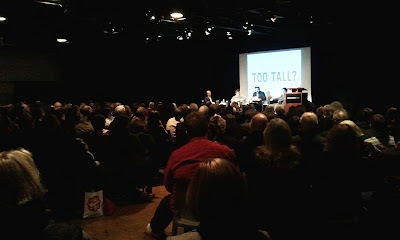 last night, the participating architects of the exhibition, TOO TALL? were invited along with Roberta Brandes Gratz, journalist and urban critic from new york, and Misha Glouberman, the host of Trampoline Hall, to discuss their ideas on development of the urban city in relation to the vertical landscape. i really enjoyed the heated discussion the four panelists shared, especially about the idea of density and high rises serving more effective means of presentation on street level. if you would like to learn about what are some of the answers to the questions, how tall is too tall? the exhibition is on until december 31.
drinking coffee again, reading more books, jogging regularly, loving milly more than ever and trying to eat more greens.